Enjoy a 7 day chauffeur-driven private tour of the Yorkshire Dales, North Yorkshire Moors, Lake District & Northumberland. There are many wonderful places to see in Northern England starting with All Creatures Great and Small’s James Herriot’s ‘Herriot Country’ which is right on our doorstep. Travel with us on this truly unique private seven day tour to see the places you may only have read about, and we will show you parts of England that you would never have imagined to exist. We will take pride in showing you the best of Britain’s heritage and wonderful countryside: From the rugged natural beauty of Wordsworth’s Lake District on our West coast, over the Pennine Hills and down through James Herriot’s glorious Yorkshire Dales, to the historic Roman city of York and the magnificent York Minster. You may wish to carry on to our East coast and experience the buzz of Whitby Harbour or sleepy Staithes. We offer our Yorkshire tours as either 1 day, 3 day or 7 day tours. We are very flexible and can cater to your requirements, whatever they are. So if you would like a different tour length just contact us for a chat! Our tours of the Yorkshire Dales, North Yorkshire Moors, The Lake District and Northumberland are not bus tours, we provide private, chauffeur-driven tours for up to 4 guests in our luxury 4×4 vehicle. 1 full day visiting your favourite places in Yorkshire, just tell us where you want to go! 3 full days visiting your favourite places in Yorkshire, Northumberland or The Lake District, just tell us where you want to go! All entry fees to stately homes, castles and museums etc. 7 full days visiting your favourite places in Yorkshire, Northumberland or The Lake District, just tell us where you want to go! B&B accommodation with full English breakfast (may not be applicable to 1 day tour). Personal guide/chauffeur and luxury vehicle for the entire tour. Please note: if you are booking your tour through a travel agent there will be a small surcharge added to the above stated prices. Relax in the comfort of your personal chauffeur vehicle. Tour the countryside of the Lake District, Yorkshire Dales, North Yorkshire Moors and Northumberland. Visit some of England’s finest country estates, castles and gardens. Spend a day in the Lake District, maybe visiting Wordsworth’s Dove Cottage. Explore Alnwick Castle and the beautiful Northumberland coastline. Your itinerary will be tailor-made to suit what you wish to see and any events you want to visit. We will provide an up to date list of local events, should you wish to visit any of them. What you do each day can be planned in advance or you can leave it until you arrive and then choose the places and attractions you want to see and experience. It will be your choice how you spend each day at whatever pace you prefer. Your tour will begin by being collected from Manchester Airport and upon arrival and settling into your choice of accommodation we will have a chat with you over refreshments about where you would like to see and visit. Herriot-Country Tours are the UK’s leading operator for tours of James Herriots’ Yorkshire Dales. Herriot-Country Tours are members of The Yorkshire Tourist Board. 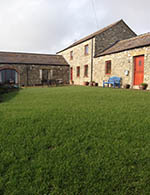 Our tour guests can enjoy staying with us in our beautifully converted traditional dairy barn, Curlew Barn, on the edge of Bellerby village in the heart of the Yorkshire Dales. 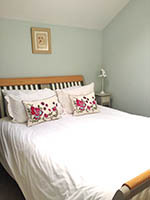 Curlew Barn has 2 en-suite double bedrooms for our guests, one on the ground floor and one on the second floor. Both have under floor heating, comfortable double beds, hospitality trays and TV. You also have access to our spacious living room and garden. Where you want to stay is your choice. 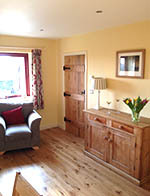 We find our guests get the most from their experience when they stay with us at our Yorkshire Dales Bed and Breakfast. Your access to our knowledge of the Dales doesn’t end when you arrive back at Curlew Barn; we could enjoy a well earned cup of tea, cold drink, or something stronger, and a chat about your day, answering any questions you may have or you may simply want to stroll across the fields to digest what you’ve seen in peace. If you would like to stay in a Yorkshire Dales pub or Country House Hotel we can recommend a few locally, just contact us to find out more.